Dinosaurs and Robots: Won't You Help? 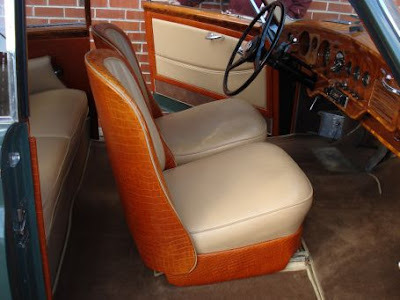 This particular example is one of just 43 left hand drive examples built, and was delivered with a number of special features, the most remarkable of which is a crocodile upholstered interior. This was an original special order feature, and though it sounds unusual, it is actually quite stunning and attractive in person. ..with a crocodile interior restored in 1995 at a cost of just under $12,000? 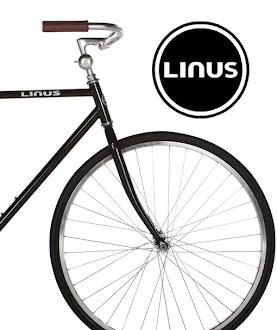 That IS remarkable. The interior of the car is stunning. The wood has been spectacularly refinished to concours condition, while the upholstery is in similarly nice condition. The crocodile upholstery is actually leather that is embossed with the crocodile pattern, though the original crocodile upholstery remains on the inside of the rear armrest. 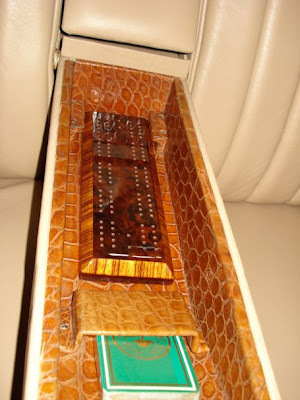 The rear armrest also contains a beautifully restored cribbage board, a deck of cards, and a vanity mirror. Yes, crocodile :: embossed leather, concours :: nice. Maybe if enough people send $10 text messages with "CROC" in them, the new owner will be able to afford to recover from this heartbreaking disaster.